The role that you, as a leader-presenter, play in public is up to you. As a general rule, the closer you are on stage to what you are in private, the more meaningful and believable your presentation will be. We offer four models of leadership presentation (see Figure 2-1). The first type of leadership communicator is the expert, or the keeper of the mission. The expert holds to the organization's mission—what the organization is and how it conducts business. Experts base their decision making on facts and their relationship to the business environment—how the company can anticipate and capitalize on market opportunities. Colin Powell is an excellent example of the expert who understands the mission and what it takes to fulfill it. As one who was raised in the military as a soldier and then as a military aide to politicians, Powell knows his subject matter. When you listen to him speak, he presents his point of view as a matter of fact; in other words, he is abiding by the mission. Corporate leaders, too, can be experts. They also keep close tabs on their human resources, always evaluating whether they have the right people doing the jobs and what they need to do to develop the next generation of leaders. The second type of leadership communicator is what we call the visionary. Visionaries are those leaders whose ardent belief in their cause outweighs their words. Their speaking style comes from deep within, from their inner core values. Their mission is to persuade, to change points of view. And their leadership does not stop when the words do. Rather, it continues in the conduct of their daily lives. One of the most impassioned leadership speakers of our times is Steve Jobs. A pioneer in the development of the personal computer, Jobs is a highly vocal advocate for the integration of technology into one's lifestyle. An accomplished speaker, Jobs knows how to involve the audience, how to tell a story, how to use language to draw mental pictures, and, most convincingly, how to use his passion to persuade others of the inevitability of his cause. Jobs mixes the language of technology with a gee-whiz fascination with the possibilities of what digitally based personalized technologies can deliver. His experience in Hollywood as a founder of Pixar, an animation house, coupled with his iconic stature as the co-founder of Apple Computer, lends Jobs a stature that few in his industry can match. Another secret to Jobs's ability to sell his message is his willingness to intertwine his personal destiny with that of Apple. Thus, his message becomes larger than life and has more of an opportunity of being heard, not simply by dedicated users of Apple computers, but also by the mainstream media. In our context, the visionary has a passion that supercedes spoken words. The message itself is always in what the speaker says—as it is with the expert—but what gives it power is the leader's conviction concerning the cause. The visionary as a leader-presenter is consumed with passion. He or she believes in the cause and wants others to embrace it. The third type of leadership communicator is a combination of the previous two—part visionary and part expert. We call this type of leader the coach. The coach is a collaborator, the one who is called upon by virtue of her or his expertise in a particular subject. Coaches are those who change organizations one person at a time. They look for the unique way to communicate to an individual by discovering what motivates that person, e.g., more money, advancement, or prestige. Once the coach learns the motivational point, he or she can leverage it to help the person succeed. More and more management, and by extension leadership, involves coaching. Why? Leaders are evaluated on the results of their people. It is up to the leader to enable the team to succeed. Success depends upon communication, as the leader must determine what people need and how the leader can deliver it. Leader-coaches must adjust their focus throughout the day to address the needs of individuals as well as the needs of the team. The model of the successful sports coach is an apt example. Vince Lombardi was a coach who was able to communicate to players one at a time; his players say that he got them to play better because he raised their expectations of themselves. In other words, he elevated their own perceptions of their abilities and in so doing enabled them to play better. When Lombardi addressed the entire team, he leveraged the raised expectations to the entire team. But he did more: He provided a firm foundation. How? By teaching. Having begun his coaching career as a high school teacher, Lombardi continued his teaching of the fundamentals. His teaching gave the team a framework upon which they could apply their individual and collective talents. The fourth type of leadership communicator is again one part visionary, another part expert, but this individual leans toward the visionary. He or she is the transformer: The mission is to persuade—to change minds. Transformers also are one part visionary. They know where they want to take their people, and they apply their selling skills to convince people to come along with them. 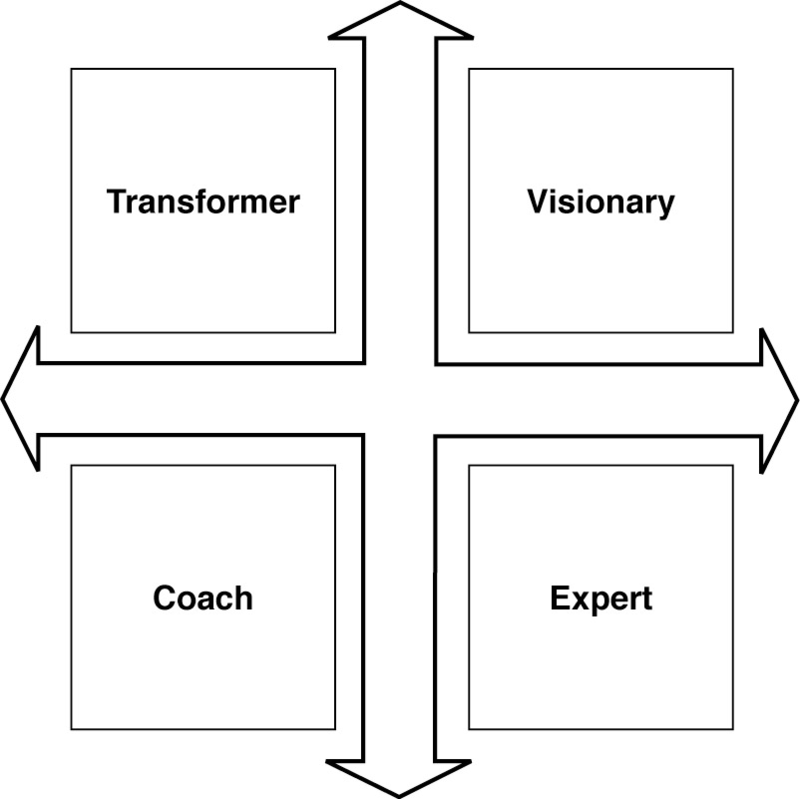 The transformer as a leader-presenter is one who has both the information and the conviction to persuade the listener to her or his point of view. Think of a successful salesperson. Think of the words that come to mind when you think of such an individual: knowledgeable, personable, willing to take questions, patient, and persistent. All of these are qualities that salespeople—and presenters who want to persuade others—need to have in abundance. A good example of a transformer is Mother Teresa. As a sister working in the slums of Calcutta, she brought food, rudimentary medical assistance, and hope to the street people. Realizing strength in numbers, she founded a missionary order to carry out her good intentions. Their continual presence in Calcutta reminds the rest of the world of its obligation to those less fortunate. As word of her work spread throughout the world, she became a willing participant in "selling the mission" to those who could be of assistance. She badgered popes, princes, presidents, and celebrities, all in the name of her mission. She communicated her zeal for her mission through her writing and her public appearances. Her example reminds us of what it takes to make a difference. Keep in mind that your leadership communication style may vary from situation to situation. One day you may need to be the expert, adhering to the organizational mission. Other times, you may act as the coach, willing to advise, but careful to let the audience make up its own mind. And still other times, you may be communicating in all four modes, depending upon the situation.